NEWSFLASH - white wall tires in ST (special trailer) now available at Diamondback - see below! 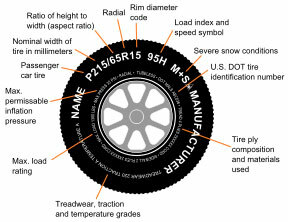 How to translate the codes on your tires. Be sure to use ST, not P tires on your trailers! Original tires were 640x15 which are very hard to find these days. Modern equivalent is ST205/75/15, with radials now being recommended both for a higher speed rating and more durability than non-radials. Tire Article - whys and wherefores - ST vs. P, etc. Any local tire shop should be able to sell you the right tires. Just be sure to get ST (special trailer) tires. ST205/75/15 (current thinking is that it is best to go with "R" radial ST tires as they are lasting longer and have a faster speed rating, however, radials have a fatter sidewall bulge and may make it more difficult to get on and off a Scotty). White wall tires ST are now available at Diamond Back. The link takes you to their 2013/2014 catalog. Scroll down to page 15 and voila! There they are. 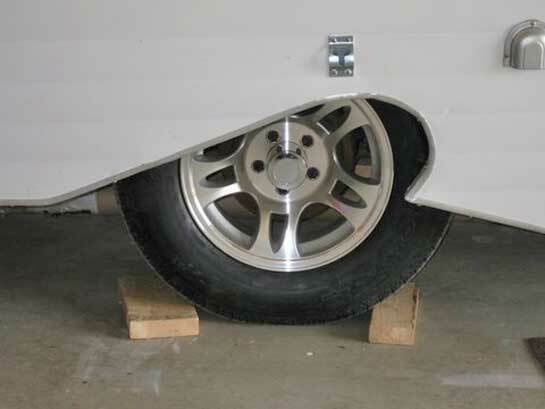 Order the load size for your trailer's weight. Many thanks to Kevin Y. for passing along that Tractor Supply Centers (TSC) carry the right wheels with an ST205/75/15 tire already mounted. Use the Store Locator link to find a TSC near you. Note from Len: At an auto junk yard: I always ask for a rim from a 1984 Ford Ranger. Its a 15", 4 1/2X5 rim that will fit and take a Scotty hub cap. And its easier for them to look up and find. Heard from Doug with a 1989 double-axle Scotty - his wheels were 15 x 5 5 bolt, (Ford) just like the earlier Scottys. William G. reports that 1979+ Scotty LITE models have 13" wheels with a 4x4 pattern.